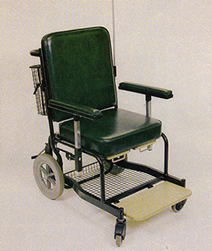 A front steering portering chair, mounted on 315mm wheels with a foot operated brake assembly at the rear and 100mm swivel castors at the front. The standard chair has a fixed basket with integral oxygen cylinder holder at the rear (designed to take x-rays and medical files) and a useful tray underneath for patients personal belongings. This porters wheelchair is upholstered in flame retardant vinyl fabric to BS5852 in the colour of your choice from the Chieftain range.